Kuala Lumpur: Asie Sdn Bhd has dished out the first contract for the RM9 billion privatised urban regeneration project in Kuala Lumpur to Mah Sing Group Bhd, Malaysia's fifth largest property developer by revenue. The contract given to Mah Sing entails it to undertake a niche development on 1.6ha. Called M Sentral, it will feature serviced residences and retail lots worth a combined RM900 million. The urban regeneration project, dubbed Tamansari Riverside Garden City and mooted more than 10 years ago, is one of key developments under the Entry Point Projects. Asie, a private concessionaire, has full rights and approvals to build residential and commercial properties, leisure, recreation and infrastructure facilities on 15 parcels of development land with five air rights in Precinct 2-Pekeliling of the River Corridor Development under the Blue Corridor policy of Kuala Lumpur City Plan 2020. Located on 23ha along Jalan Tun Razak-Jalan Pahang, the former site of the Tunku Abdul Rahman flats or Pekeliling flats, the 15-year project is envisaged to be bigger than Mid Valley City. Yesterday, Mah Sing's wholly-owned unit, Grand Pavilion Development Sdn Bhd, signed a joint venture agreement (JVA) with Asie and its subsidiary Usaha Nusantara Sdn Bhd to develop M Sentral. Under the JVA deal, Usaha Nusantara will grant Grand Pavillion the sole and absolute rights to develop the 1.6ha land for an entitlement of RM106.60 million. This will be settled via 60 per cent in cash (RM63.96 million) and 40 per cent stake in Grand Pavillion. Mah Sing will continue to have 60 per cent shareholding in Grand Pavillion, it said in a statement issued yesterday. Mah Sing group managing director and group chief executive officer Tan Sri Leong Hoy Kum said work on M Sentral will commence by the first half of next year, pending authorities' approval and fulfillment of conditions. It will take five years to develop. Leong said there is a provision for a sky bridge's connection to the remaining 58 acres, in line with the understanding that Mah Sing may be the potential joint venture partner for other parcels within the land, subject to terms and conditions to be mutually agreed upon. Well connected: Pekeliling flats area is close to transportation facilities. PETALING JAYA: Mah Sing Group Bhd has secured a project to develop part of the former Pekeliling flats area into serviced residences and retail units with an estimated gross development value (GDV) of RM900mil. To be known as M Sentral, the project will comprise serviced residences and retail units along Jalan Tun Razak-Jalan Pahang and forms part of a privatised urban regeneration project in Kuala Lumpur, the property company said in a statement yesterday. According to Mah Sing's press release, the entire regeneration project has an estimated GDV of RM9bil, and covers 58 acres. Mah Sing also said that this is the largest privatised urban regeneration project in the city centre, with M Sentral being the first part of the entire project. For its venture, Mah Sing's wholly-owned subsidiary Grand Pavilion Development Sdn Bhd together with private company Asie Sdn Bhd which has full rights to develop the 58 acres and its subsidiary Usaha Nusantara Sdn Bhd will develop 4.08 acres into “smaller sized and more affordable” serviced residences as well as some retail units. No additional information was provided about Asie. But earlier media reports indicated that the urban renewal development of the decades-old Pekeliling flats dated back to as far as 1997, when the project was approved by Kuala Lumpur City Hall. Asie was then said to be among several companies that vied for this major renewal project. It is unclear what had stalled the project up to now. Under the RM900mil GDV joint-venture project between Mah Sing and Asie, there is a provision for a sky bridge connection to the balance of the 58 acres, “with the understanding that Mah Sing may be the potential joint-venture partner for other parcels within the land subject to terms and conditions to be mutually agreed upon,” Mah Sing said. “I think it stands a good chance (of developing the rest of the land) owing to its track record,” CIMB Investment Bank Bhd research head Terence Wong said. Analysts noted the project “could not afford to fail” given its prime location in the city centre. 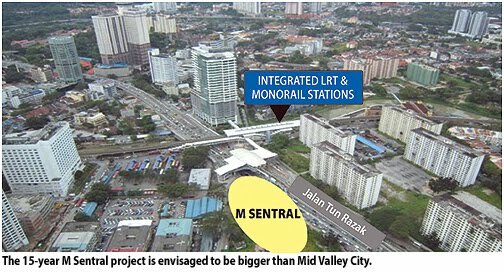 Subject to relevant approvals, the proposed development M Sentral is expected to start by the first half of next year and will be developed over a span of five years. Wong said the project would be “positive” for Mah Sing in terms of earnings and had inputed a 5% to 10% earnings increase from it together with Mah Sing's latest acquisition of 205.72 acres of freehold land in Johor Baru for the development of its Mah Sing i-Parc, an integrated industrial and business park. Mah Sing group managing director Tan Sri Leong Hoy Kum said in the statement: “Acquisition of strategically located land is part of our growth strategy, and urban renewal projects allow access to prime land in the city centre. Mah Sing's well-known property development projects include M-Suites and M-City, both located along Jalan Ampang, KL. Leong said M Sentral was poised to be “the next major transit hub” and the target market for the project included local executives and expatriates. M Sentral is within the catchment area of Kuala Lumpur, Jalan Ipoh, Sentul and also Petaling Jaya as it is close to transportation facilities such as light rail transit (LRT) and monorail stations, he said, noting that the Titiwangsa Monorail Station and the Titiwangsa LRT stations were within walking distance while the Sentul KTM station was about 3 km away. 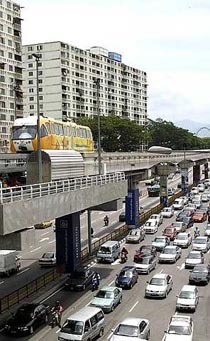 A future mass rapid transit has also been planned for Titiwangsa, according to Leong. Under the joint-venture agreement, Mah Sing's unit Grand Pavilion will be granted the right to undertake the development of the land for RM106.6mil. This amount will be partly settled in cash (RM63.96mil) and partly by giving Asie's unit Usaha Nusantara, a 40% stake in Grand Pavillion. Shares in Mah Sing ended yesterday up 4 sen to RM2.44 in a weaker broader market. On Wednesday OSK Research was positive on the joint venture agreement between Mah Sing Group Bhd's wholly-owned unit, Grand Pavilion Development Sdn Bhd and Asie Sdn Bhd and its subsidiary, Usaha Nusantara Sdn Bhd. In a statement OSK said the agreement was for the proposed joint development of prime leasehold land along Jalan Tun Razak here, measuring approximately 1.65 hectares. "The agreement will enable Mah Sing to replenish its landbank and project pipeline as well as gain access to sizeable prime landbank in the Klang Valley," it said, Bernama reported. OSK said under the agreement, Grand Pavillion also intended to undertake a niche development, M Sentral, comprising flexible-sized and more affordable serviced residences with an estimated gross development value of RM900 million. "We think it is fair deal, considering the current market value of land in the surrounding area, as well as its strategic and prime location," it said. It said the proposed development was expected to commence by first half 2012 and would take five years. OSK has maintained its forecast and 'buy' recommendation on Mah Sing with an unchanged fair value of RM3.01. KUALA LUMPUR: There is a property bubble building up in Malaysia and the region but it is nowhere near alarming levels as the main indicators are still at comfortable levels, AmInvestment Bank Group said. "As an investor, I love bubbles because that's where the money is. 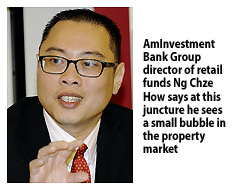 At this juncture, I see a small bubble in the property market, it's no where near big yet and I'm not seeing any property bubble bursting soon," AmInvestment Bank Group director of retail funds Ng Chze How said. "For that to take place, I think you need to see a few factors taking place. Firstly, you need to see very high overall borrowings and leveraging, which is currently not happening. Secondly, is to look at the non-performing loans (NPLs). Across this region, the NPLs are still very healthy. Thirdly, you need to look at the liquidity in the market. There's so much liquidity, so much cash sitting in the system." Ng was speaking to the media after the launch of the country's first Asia Pacific REITs unit trust fund by AmMutual here yesterday. The unit trust funds will be solely investing in REITs in Asia. For a start, it is looking at Australia, Hong Kong, Singapore, besides a minimal exposure in Malaysia. The fund will be managed by Funds Management Division (FMD) of AmInvestment Bank Group. "When we are creating this fund, we want it to be riskier than bonds but safer than equities. This fund does that. It offers investors opportunities to diversify away from stocks and bonds and thus, reducing investors' overall portfolio risks," said FMD chief executive officer Datin Maznah Mahbob. She added that investors will receive high dividend yields from investing in REITs as the fund is structured to distribute a high percentage of its profit to shareholders. Over the past five years, the performance of REITs in Asia had outperformed global REITs by more than three times. During the period, REITs in Asia grew 46.2 per cent, while REITs globally grew 14.4 per cent. "We are comfortable with Asian properties, in line with the region's continued growth, which will lead to an increasing demand for commercial occupancy rates in Asia, which are averaging to above 90 per cent. "For certain countries in Asia Pacific, we are seeing an uptrend in rental rates for both offices and the retail sector, which will bode well for unitholders of REITs as this translates to higher income distribution," said Andrew Wong, chief investment officer of equity, asset allocation, and fund management. The approved fund size is 200 million units with an initial offer price of 50 sen per unit. The initial offer period ends this Sunday, and its minimum investment being RM1,000 for Malaysian residents and the minimum additional investment for Malaysian residents is RM500. The fund is distributed by all AmBank branches, AmBank Agency sales force, AmPriority Banking, AmPrivate Banking and Hong Leong Bank. Mutalib to helm 1Malaysia Housing Programme? PETALING JAYA: The recently announced 1Malaysia Housing Programme (Prima) is likely to be helmed by the low-profile Datuk Abdul Mutalib Alias, according to sources. Prima is a scheme designed by the Government to ensure the availability of affordable quality homes within the Klang Valley for the people, in particular the youths. Abdul Mutalib is currently the special officer in the Works Ministry. Previously, he was a political secretary for former Minister of Science, Technology and Innovation Datuk Dr Jamaludin Jarjis and also for former Finance Minister Tun Daim Zainuddin. Although Prima is still in its infancy stage, the Government has indicated some moves to expedite projects under the scheme. One of the initiatives could entail making land available and providing funds to developers participating in Prima under public-private partnerships programme. Prime Minister Datuk Seri Najib Tun Razak launched Prima for first-time buyers to own homes of up to 1,400 sq ft in July. Depending on the location, the houses would be priced at between RM150,000 and RM300,000 while the minimum size would be 800 sq ft. The buyers, making up those who earn not more than RM6,000 a month, would enjoy financing of up to 105% from selected financial institutions. The additional 5% is for insurance and sales and purchase legal fees. A total of 42,000 houses would be built in 20 strategic locations in the Klang Valley, Rawang and Seremban with eight projects expected to commence this year. In addition to Prima, the Government had also earlier announced the My First Home Scheme which aimed to support first time home buyers with a monthly income of below RM3,000 to secure financing for homes priced at between RM110,000 and RM220,000. This measure underscored the growing concern surrounding the housing needs of the middle income group, which has a monthly household income of RM2,300 to RM6,000. This group is believed to comprise about 40% of the population. BEIJING: Average new home prices in 100 major Chinese cities rose 0.2% in July from the previous month to 8,874 yuan (US$1,380) per sq m, with growth slowing slightly under the influence of official policy tightening, a private data provider said on Monday. 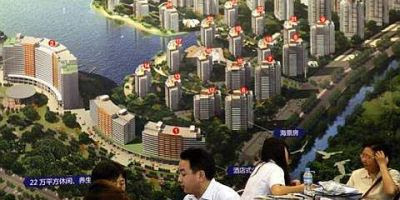 But the index compiled by China Real Estate Index System (CREIS), which is affiliated with China's largest online real estate company Soufun Holdings Ltd, showed July prices were up 6.8% from a year earlier, compared with June's 5.2% gain. The data gives a snapshot of housing inflation, a main driver of rising consumer prices, before Beijing releases its official data on the 18th each month. “Some developers have started to cut prices quietly and more will do so in August,” said Ge Haifeng, deputy managing director in charge of index research at CREIS. “With supply rising in September and October, Chinese developers will face more downward pressure,” he said. The 0.2% rise in prices in July from the previous month compares with June's monthly gain of 0.4%. In line with Beijing's tougher crackdown on property speculation in major cities, property inflation was more buoyant in smaller cities in July. New home prices in the top 10 Chinese cities rose 3.9% in July from a year earlier, but stayed roughly the same in month-on-month terms. Among the top 10 cities, the southern cities of Guangzhou and Shenzhen led price rises in July, with annual growth of 10.1% and 10% respectively, while prices in Shanghai saw an annual decline of 0.1%, it said. China has rolled out measures, including credit controls and purchase restrictions, to cool home prices and curb speculation as part of an effort to check inflation. Beijing last month expanded purchase restrictions in second and third-tier cities, further dimming the real estate sector's outlook and boosting expectations for price falls in the rest of the year. A slowdown in the property sector would come just as the country's broader economy eases. Separate surveys published on Monday indicated the factory sector struggled with the weakest activity in 28 months in July as manufacturers grappled with credit shortages and softening global demand.